I need to make a few more items for my Etsy shop, here. So, I broke out some beautiful pattern paper from Poland: Lemon Craft: Forget Me Not. I used the current sketch from Mojo Monday. here is the recipe: I used Lagoon card stock by Stampin' Up! for the card base. Love this color of blue, and I think it really works well with the blue blossoms on the pattern paper. I adhered the pattern paper of forget me not blossoms and white music scores to the same size whisper white card stock, by Stampin' Up!. I then added a simple machine stitch border to this paper. I wrapped a strip of gold satin ribbon around this panel and adhered it to the front of the card. The smaller/focal panel was created with a different pattern paper. I matted this paper onto a pool party card stock, by Stampin' Up!. I added a simple machine stitch border to this panel, also. 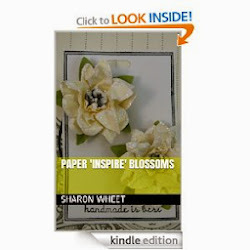 For the blossom, it is actually made from Very Vanilla satin ribbon, by Stampin' Up! It is twisted and tucked. I added two card stock leaves to this blossom. I hot glued the blossom to the canvas tag. I tied a multi-loop bow with pool party seam binding, by Stampin' Up!. I added a short length of crochet trim behind the bow and tied to the tag with a thin piece of white tulle. I used the tulle to tie the white vintage button, from Paper Trey Ink. 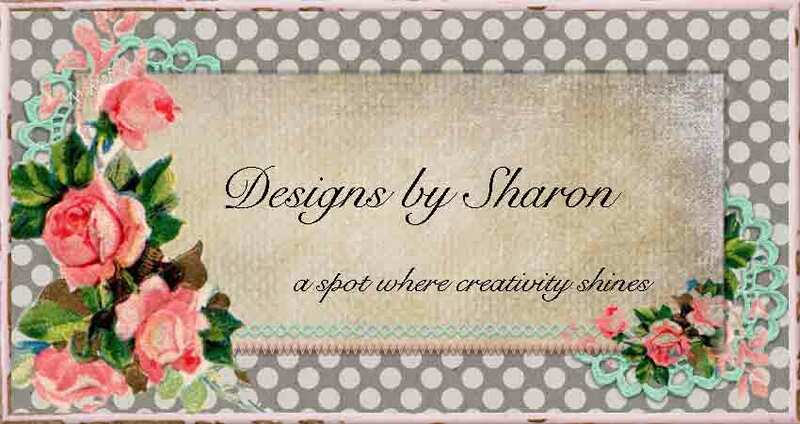 The banner piece was made with a 1/2" short piece of shimmer white card stock, by Stampin' Up!. I used the Teeny Tiny Wishes stamp set, and inked with Soft Suede classic ink, both by Stampin' Up!. And to give my card its finishing touch, I added a trio of marshmallow white faucet sequins. hello Sharon! 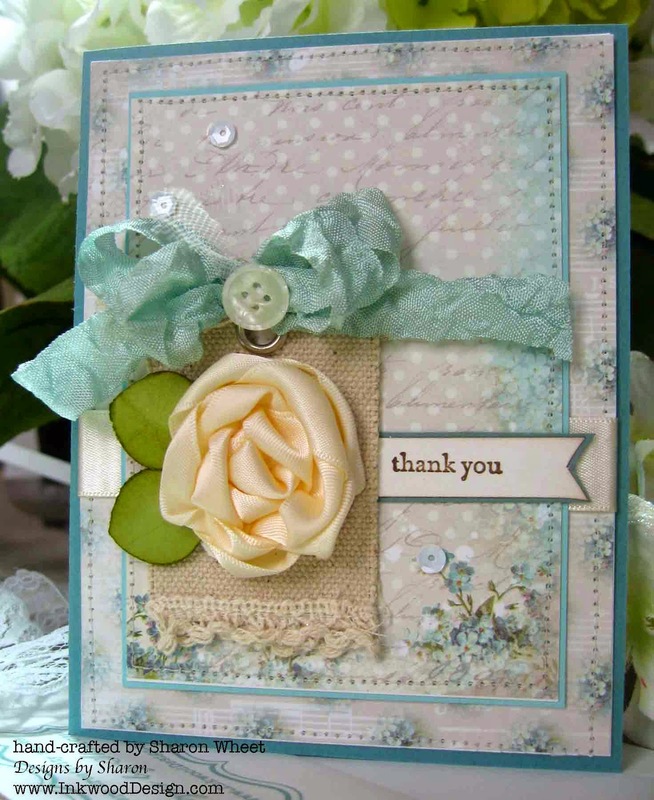 I adore this, gorgeous card..WOW! 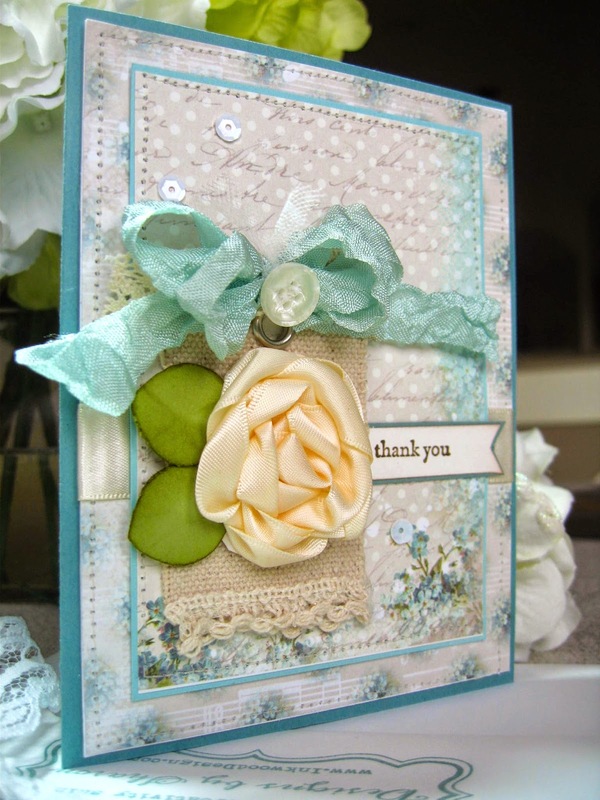 Simply gorgeous, the satin flower looks amazing and the patter paper lovely, the colors you chose really make this card so romantic and sweet.